Its this time of the year we all take resolutions always for good. When it comes to food, the resolutions revolve around the word healthy. Each and every one of us want to eat healthy, follow a healthy diet without breaking the resolutions. But what exactly does the big word ‘Healthy’ mean ? The word healthy is different for everyone. Some say vegan is healthy, some go for paleo, some for just raw foods. When I learned sweets with added sugar is not healthy, my heart broke. But who cares ? I sewed my broken heart with more sugar, like the dates I added to make the cranberry pear smoothie a little sweet. When someone offers a cake or a good piece of pastry, I never think this is not good for my health just because it has lots of sugar and butter. I enjoy all of the so called unhealthy food if I like them, but in moderation. That is what I mean by healthy. 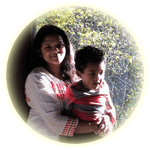 ♥ ♥ ♥ Happy New Year ♥ ♥ ♥ with love and prayers on behalf of my family and me. Today, we are going to make a colorful smoothie. The magical cranberry pear smoothie makes a vibrant in-between pink and red shade.When blended together, it was pink in color. Then when I pored it into a serving glass, The pink color intensified. Then after sitting for sometime (for the photography part) the color changed making a red-brown hue. This color change must be due to the oxidation process that occurs when cut pears are exposed to oxygen. The color changing process might be slowed down due to the acid in cranberry. Although they are very tart, I love cranberries since they give so much good color naturally to any dish. I buy lots of cranberries when the price is low and freeze them for later. Since I can have them raw, I love them in my smoothies. Also they are rich in antioxidants and low on glycemic index. They help prevent UTI (Urinary Tract Infection). Studies say the proanthocyanidins in cranberries prevent the bacterial attachment to the lining of the urinary tract. The antioxidants in cranberries boost the blood flow to brain which improves neuron signaling, memory strengthening and even reverse memory loss. Yes, they are good for Alzheimer’s Disease. 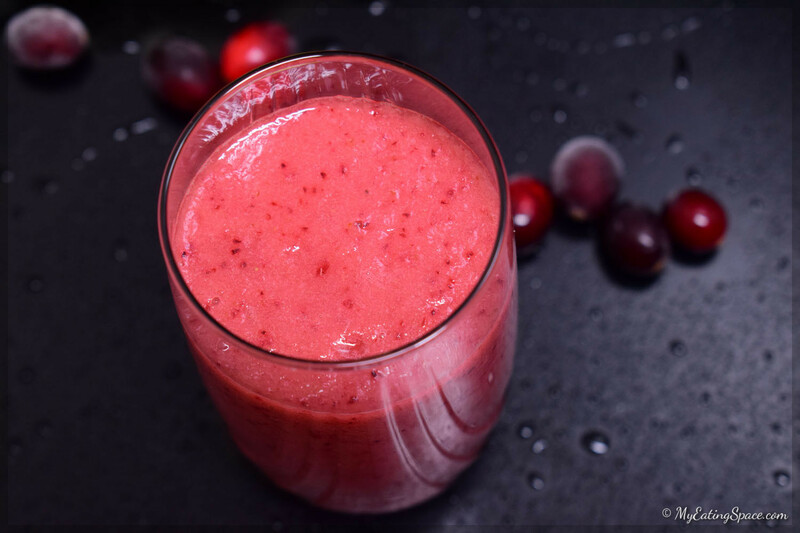 Need more reasons to make the cranberry pear smoothie ? Pear could be another good reason. They are rich in fiber and low in calories. Pear is a nutrient dense food that make us feel full faster and longer. They are a good source of vitamin C and phytonutrients which prevents oxidative damage and helps in normal metabolism and tissue repair. The fruit is sodium-free and rich in potassium. Pear can be consumed by diabetic patients too as they are low in glycemic index (GI). I hope no one needs more reasons to make this colorful cranberry pear detox smoothie. So lets jump to the recipe. The colorful cranberry pear combination don't even need words. This nutrient packed smoothie is all you need for breakfast. 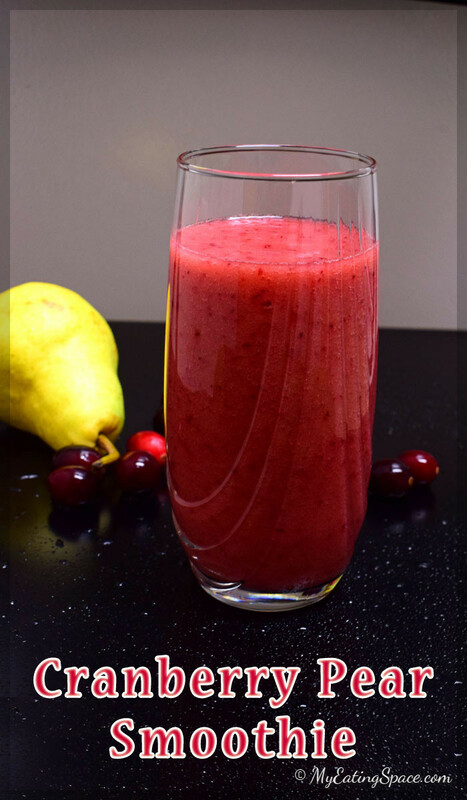 Blend the cranberries, pear and water together in a blender until smooth. Add dates as needed to sweeten the smoothie. Blend again to mix. Add ice cubes for a chilled smoothie. Taste the smoothie before adding sweetener. Sometimes pears are very sweet which can make a cranberry smoothie sweet. You can add sweeteners like honey, sugar, maple syrup, agave nectar or dates. I used 3 dates to sweeten the smoothie. Actually, there is no season for smoothies if you really like them. You can enjoy smoothies in winter too. We don’t chill them during winter. Comparing the seasons, winter is the most difficult season to go through. Summer make us thirsty enough to drink lots of water. But winter fools our body that its properly hydrated. We don’t feel thirsty; we don’t drink much water. Dehydration is dangerous, no matter which season we are in. But drinking about 2 liters of water everyday in winter is very difficult. Fruit smoothies like the hydrating cranberry pear combination is my way of keeping hydrated. The cranberry pear smoothie is featured in Pieced Pastimes. See it here. I love trying out new recipes! I wouldn’t have thought about adding pear to one though! This looks DELICIOUS!